Updated 8/4/15 12:45pm | Spring is here and, even though there may be a chill in the air many Alert1 members are eager to get into the yard. Now is the perfect time to start thinking about giving the yard or garden some TLC. While you're outdoors, be sure to take precautions against pollen and allergy triggers. It is time to care for the lawn, prepare planter beds, prune vegetation, and start new growth. Taking proper steps now will ensure a beautiful, flourishing yard and garden. We recommend a few tips in this article to keep seniors and their gardens in tip top shape. Modifying your gardening techniques and tools will equip aging loved ones as they go about their routine gardening tasks. There are ergonomic gardens that caregivers and seniors can construct if they experience imitated with mobility. A vertical garden or trellis can make lighter work of pruning and arranging plants. With a vertical garden, your senior won’t have to stoop or bend when planting or picking the fruits of their labor. Another good idea is to build raised bed planters. You can customize the height of the beds to be at knee level or higher, making planting and gardening much easier. The raised beds can also include built in benches allowing seniors to plant more comfortably. If you prefer to grow in the ground, you might try using a bench, stool, chair or padded kneeler to avoid stooping or squatting. To begin, take the time to rake the lawn. This will help remove thatch, which is the layer of dead grass blades, leaves, and other plant matter that builds up between the grass and soil. While thatching, check for bare spots, disease, and compaction. Lawn aeration is common in spring because it relieves compaction in areas weighed down by precipitation or heavy traffic. Fall is the very best time for seeding so, if the bare spots are tolerable, wait until then. If disease is discovered, an expert from the local nursery or garden center can provide advice on appropriate measures. Finally, pull any weeds, apply a pre-emergent weed killer, and follow up with a light fertilizer. All that’s left is to tune up the mower and sharpen the blade-- the lawn is ready for mowing season. A good place to start is with the planter beds. It is a good idea to check all borders or edges, and repair anything that was heaved up by the frost. Pull weeds before they take hold and check for new growth from bulbs planted in fall. Winter mulch can be removed, but many gardeners work it into the top layer of soil for added nutrients. This is a good time to work a layer of compost into the soil. To bring some early color into the garden, plant a few cool-season annuals such as pansies, nemesia, or snap dragons. Now is the time to plant hearty seeds such as onions, potatoes, and artichokes outdoors, as well as start more delicate seeds indoors. If the fruit trees and roses in the yard did not get pruned in winter, they should be pruned now before blooms appear. Late pruning can stress the tree and alter the crop. Finally, clean bird feeders and baths -- the garden is ready for growing season. In our golden years, we want to enjoy leisurely outdoor activities like cultivating our gardens. 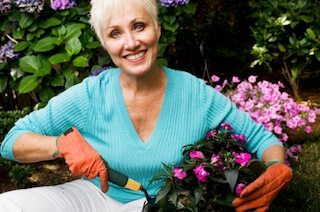 Gardening can enrich the life of your senior. Make sure your senior gardener is protected with a senior help button. A senior medical alert system can call for help if unthinkable happens while your aging loved one is in the yard. A medical alert system for seniors can be worn as a pendant or watch; it’s a lightweight and comfortable accessory for your sunhat and gardening gloves. Getting the senior help button wet isn’t an issue as our senior medical alert systems are 100% waterproof. Give your aging loved one the gift of independence with medical alert systems for seniors.